I think it is ironic that the image I am using here comes from a website titled, "Please No More Taxes.org." Our collective debt in the United States is about $1.42 trillion dollars, or about $45,000 per person. 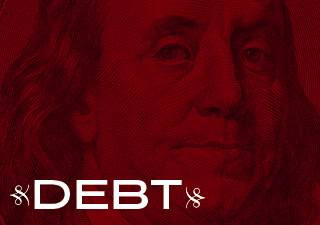 This debt has accrued because we have not taxed ourselves to match our expenditures. Those who follow politics know why this is. The guys with the money are running the government, which means that our collective, governmental decisions are not intended to benefit the society as a whole, but only the wealthy few who have seized control (in what the Supreme Court claims is a perfectly democratic system) by using their money to win elections, and then using the governmental power so acquired to benefit themselves. Many of these wealthy, of course, are corporations and those who control them. Taxes to raise money, to avoid debt, must ultimately come from those who have the money. Since those people are the ones running the government, increasing debt (rather than giving up some of that money through increased taxes), is the strategy of choice. The consumption of the rich is paid for by everyone. The benefits, by and large, stay with the wealthy. Incidentally, speaking of "Please No More Taxes.org," I credit the images used in this blog, whenever possible, by linking the image to the website from which it comes. Therefore, if you are reading this on the original blog, though maybe not on Facebook, you can click on the image to get to the source. Charging your personal credit card for consumption items will get you in trouble. If you are spending more than you earn, and are running up debt, you will ultimately have to sell off your assets (if you have any) to pay your creditors, and if you go into bankruptcy, the creditors will sell off your assets themselves through the bankruptcy process. There is a kind of debt that may make sense, and that is debt incurred to make "investments" that will increase productivity. A student loan is an example, on the personal level. Incurring debt so as to be able to have a college education will "pay for itself" and the debt can be repaid out of the increased earnings that will be achieved by a person who gets that college degree. An investment in a health care system that will reduce disease and lost productivity in the population in general is an example on the collective level. Our national (as well as personal) habits indicate that we are not doing most of our borrowing to increase our "investments," but only to increase our "consumption."